~ Used in reference to the phenomenon whereby a computer-generated figure or humanoid robot bearing a near-identical resemblance to a human being arouses a sense of unease or revulsion in the person viewing it. I’ve always been a fan of good android and robot stories and in particular I’ve always loved stories where the android wasn’t quite…right. Sure I loved the Laurel & Hardy-esque droids of star Wars as a kid but they didn’t give me the same thrill as Yul Brenner as the haywire bad guy in the original Westworld. When I later read Asimov’s robot novels I absolutely understood the skepticism and fear with which the most advanced models were met. We are as animal as the robots are mechanical and we exist only because we are hardwired to fear and attack that which isn’t like us. Were that impulse not a part of our reptilian brain we would not have lasted as a species long enough to make a conscious effort to “evolve” beyond that defense mechanism. More accurately uncounted numbers of out forebears didn’t survive raiding outsiders and dangerous beasts and so their trusting and docile natures died out to a very large degree. As a result we are still cursed with our natural tendency to group one another into categories that are superficially “friend or foe” but really more “us or other”. The instinct that allowed us to survive the savanna before we were even mankind as we think of it has, in some significant measure. given us racism, nationalism, and Cowboys fans (all teams, not picking on Cowboys fans–even though they’re awful). See how easy and natural it is, even though we know it’s wrong? The very thing that allowed us to mature as a species may well end us one day. With androids though, the instinct was often indulged in the past. It was, somewhat ironically, a “safe space” in which to give ourselves over to this basest instinct and even revel in it in films like the original Westworld, Alien, and 2001: A Space Odyssey (though to be accurate HAL was an AI with a disturbingly human/not human mind). The first time that I remember seeing this subtle indulgence of prejudice challenged was in Asimov’s The Caves of Steel in which the main character’s new, android partner creeps the bejeezus out of him. It makes him look small in a way that’s almost pitiable, though he is reformed by the end of the book. Another good run at this was actually Mr. Data in STTNG, but the issue there was that the show was already set up, due to its legacy, to defy our 20th Century prejudices and Mr. Data was written too sympathetically from the very first episode to ever truly be “uncanny”–a wonderful opportunity missed in my opinion and perfect hindsight. With all of this in mind it should be no surprise that I am a HUGE fan of HBO’s take on Westworld. It is absolutely some of the best genre television since the very first season of The Walking Dead, easily surpassing the recent seasons of that show and Game of Thrones in terms of story, concept, and sheer ambition. 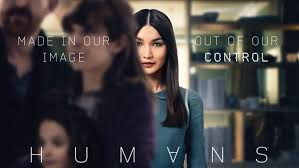 However, even before Ed Harris put on the black hat, AMC had come out swinging with Humans, a series I’m very excited to see returning in the next few weeks. 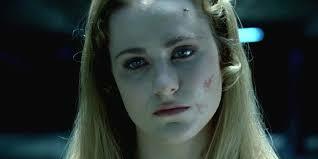 Though I have to give the uncanny, android crown to Westworld, what AMC has done with Humans with far fewer resources and significantly less starpower is quite remarkable. I was hooked from the very first episode and was happy to see a zombie/vampire/dystopia/apocalypse free sci-fi universe once again. My hope, though I am a committed fan of both TWD & GOT, is that we’re moving into a space in spec fiction that is as well done and, if not a little smarter, certainly more likely, almost certain, to be relevant in a future that many of us will live to see. To that end I’ll be making my own small contribution in the form of a new anthology (hopefully anthology series if it goes well) dealing specifically with that space where robots go from cute vacuums and friendly starship officers to entities that we can just barely spot as “other”, whose motivations and intentions we may not quite understand, who may test what we believe as well as what we’re made of. These are the themes I’m looking for, the intersection of fearful prejudice and reasonable caution, understanding and misunderstanding, all the things that creating machines/beings so close to ourselves, but inevitably unknowable on some level, will generate. I would certainly recommend either of the shows I’ve referenced for anyone, not just writers, but I’m not looking for a knock-off or fan fiction. Hit me with your own idea, your own fear. The possibilities are as vast as human folly and human grace with everything in between because, ultimately, The Uncanny Valley is really all about us. That’s why Delores and Mia are such effective characters–they can fool us completely, passing as human, in one moment and creep the bejeezus out of us with their alien aspect in the next. I’m accepting submissions effective immediately. I hoping to have enough stories to put out the anthology before the end of 2017. I don’t have a deadline yet, but don’t dawdle. I’ll definitely be taking submissions into the summer, but probably not too far into the fall as I’ll need to get the stories edited and the book put together. I can’t wait to see what comes of this. Please send submissions to AuthorLALittle(at)gmail(dot)com. ← New Year, More Work!